Paver patios are one of the most popular home projects around. They look great, and can really give a focal point to a backyard. Do your homework and draw out the patio plan on paper. If you’re planning an intricate design or edging, draw that out in as much detail as you can. Then get a spray can of marking paint and physically mark the patio dimensions on the yard or soil. Mark any design locations as well, just so you can see if the size and placement look right. This also helps you discover unexpected surprises, like a sprinkler heads . . . Beyond that, this is a great way to see if the plan works on the ground as it does on paper. And at this point, if you don't like the shape or location, you can change it -- and would you believe that some people actually do things like miscalculate their measurements on paper? By the way, when you're happy with everything -- but before you actually begin to excavate, spray-mark another a line a foot or so outside the actual patio dimensions. That’s the line you’ll actually excavate to, so you room to install the edge restraints without working from the top of your beautifully compacted and graded surface. Whether you’re removing sod or soil, you need to lower the existing surface so the top of the pavers will be even with the surface once the base layers and pavers are put in place. Assuming that the patio is for people, begin with 4 inches for the gravel sub-layer, add 1 inch for a mid-layer of sand , then add the thickness of stones. Pavers commonly are 4 inches deep. So, generally, expect to remove about 9 inches of sod and soil -- more if you’re building a driveway, which calls for an even deeper foundation. The objective is to excavate a flat surface with a slight slope, so water doesn’t pool up, and runs off in the proper direction (P.S. Don’t slope the patio toward the house!!!). A common rule of thumb for slope is a 1 inch slope for every 4 feet. Place stakes at intervals along the marked edges, and use a levels to ensure the surface is flat and has the proper slope. Edge restraints go in later, so while you dig and compact, stakes, string and boards are your reference points for depth, shape and slope. You'll be using a plate compactor, and depending on the softness of the soil, you may want to compact the soil. From there, lay down the geo-fabric that prevents silt from oozing up to the patio surface, and spread the sub-layer of gravel. 3/4 inch and finer is a common size for a patio sub-base. Spread the gravel a little more deeply than called for when compacted, and crisscross the plate compactor over the gravel surface at least twice. If you’re looking to do a good job on the mid-layer of sand, you’ll “screed” the sand to a consistent level surface buy using 1 inch PVC piping as rails, and dragging a board across the rails it to set the sand evenly. 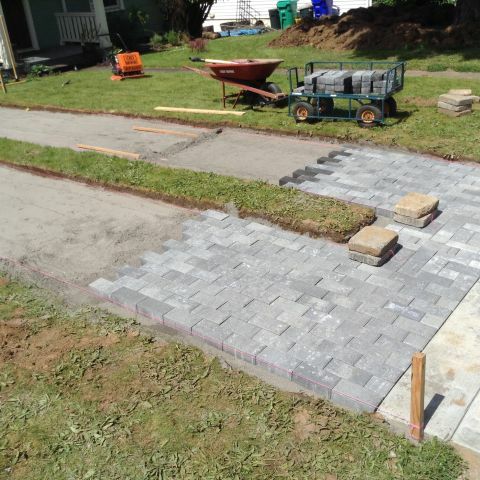 At this point, you don’t ever again want to step on the completed surface – you’ll install the restraints working from the outside of the shape, and once you begin laying stones, you’’ll work across the patio from a starting edge . No foot prints in that pristine sand!! Edge restraints are available in a variety of materials, but in any case, they're secured in place by some form of spike. Pros commonly use 10 inch by 3/8 steel spikes. If you want your patio to fall apart, skip edge restraints entirely. Or, to have it collapse more slowly, use smaller plastic stakes, instead of steel. If you want all of your hard work to last and look good over time, don’t cut any corners on edging. One valuable time-and-trouble saver when installing edges – especially curves – is to drive the stakes only a third of the way into the ground, until you’re sure of your line shape -- it can be tough and messy to pull up fully driven 10-inch stakes after you’ve recognizing that you mis--laid the arc of your curve. Of course your plans call for an intricate design! All we can say is when you're laying the stones, have the design detail handy on paper so you can refer to it! Also, in most cases, you'll need to cut some stones. Once the stones are laid, spread sand over the surface, sweep it into the cracks. Then use the plate compactor to drive sand into the cracks and make the surface smooth. Plan on adding sand here and there as you go, and on making several passes with the compactor. The last step to finish the job professionally is to seal the patio with a sand-binding sealant, which locks the sand in place, adds to the structural integrity and helps prevent weed encroachment and unwanted stains. Now, get out the deck chairs -- it’s time to enjoy your new paver patio!